Facebook appears to be testing yet another variation of Timeline, this time shifting status updates to the right side of the page. In this design test, which currently only affects select members in New Zealand, the social network continues moving forward with a single-column layout. However, status update and shared content now appear on the right side of the page while a revamped ‘About’ section falls on the left. Screenshots from The Next Web show that Facebook has updated the Timeline headers, hiding the current boxes for ‘Friends,’ ‘Photos,’ ‘Maps,’ and ‘Likes’ under a sub-menu. Should this design be applied to Pages, it would completely negate any tab customization you might have. 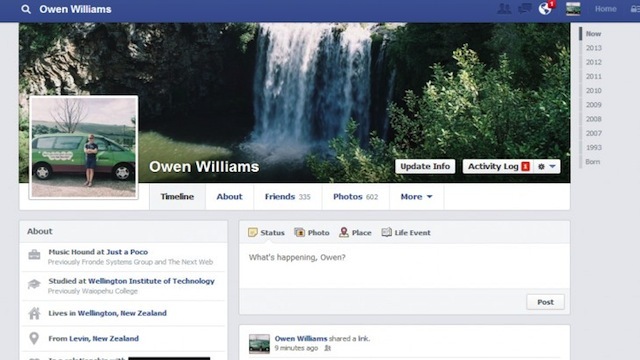 Another screenshot reveals an entirely new feature associated with posted links and Facebook Pages. In this example, a status update from BuzzFeed links to an article online while displaying a new ‘Like Page’ button. It appears that clicking on it takes members to BuzzFeed’s Page instead of just Liking it and remaining on the feed. No additional information about this feature is available, and Facebook has yet to comment. As with all tests, it’s unknown what the final product will be or whether it will affect Pages as well as Profiles. 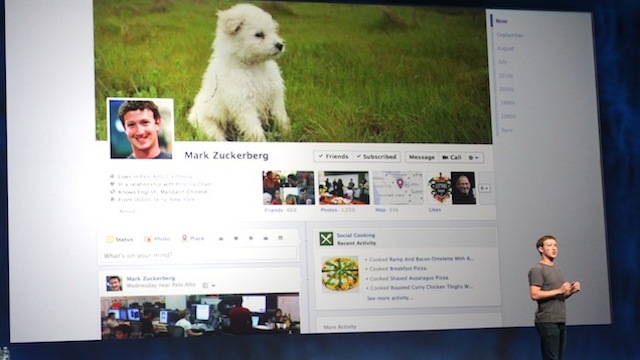 It’s still worth keeping an eye on should Facebook decide to expand the test.